Even before the markets went into full-blown meltdown mode, Intel (NYSE:INTC) stock had been struggling. Perhaps it slumped because its peers have better top-line and bottom-line growth rates. Or maybe the downturn is due to the dismissal of its former CEO. Through the first three quarters of 2018, Intel stock was up just 2.5%. That compares to the 45% rally of Nvidia (NASDAQ:NVDA) and the — wow — 200% jump of Advanced Micro Devices (NASDAQ:AMD). There’s a reason why I said investors could own all three, but should really consider AMD and NVDA over INTC. However, INTC has held up much better than Nvidia and AMD this month. Shares are down just 3%, while AMD and Nvidia are each down much more in October. What do we make of that relative strength and should investors consider Intel stock a buy as a result? Intel has always attracted many investors due to its low valuation and its dividend. The fact that its chips are built into many personal computers, along with its well-known brand name, also resonates with plenty of investors. But are those catalysts enough to keep Intel stock afloat? Although INTC easily topped analysts’ earnings expectations for the second quarter and beat Q2 revenue estimates after its sales rose almost 15% year-over-year, Intel stock fell after it reported its results. At the time, it’s not like INTC stock was expensive, as it was trading for just 12.5 times its earnings. The valuation of Intel has gotten even cheaper after its earnings-induced fall from $52 to about $45. Intel stock now trades at 10.6 times this year’s earnings, which are forecast to grow 20% versus 2017. But in 2019, the company’s EPS is forecast to increase just 2.4%. The revenue outlook is similar, with analysts expecting 10.8% growth in 2018 and just 3.1% growth in 2019. Worse, while earnings growth is expected to outpace revenue growth in 2018, the opposite is true in 2019, suggesting a potential contraction of the company’s margins. Intel stock has struggled this year, but it has been holding up OK lately. Maybe that means INTC stock won’t retreat much further. But I would be very happy if Intel stock fell to $42. At that level, Intel stock would have a dividend yield of almost 2.9% and would trade at around ten times this year’s earnings. Will Intel stock fall that far? On Thursday, Intel took out its September lows near $44, falling to $43.73 per share. However, the shares bounced and closed slightly above that level, reaching $44.23. This afternoon, Intel stock is trading near $45. But Intel stock remains locked in a downtrend, with its 20-day and 50-day moving averages keeping a lid on Intel stock price. It briefly broke above those levels in October, giving the sense that it would not drop below $44. But a further breakdown these last few days have put $42 back in play. If Intel stock falls to $42, it would be near its late-2017 and early-2018 lows. If it drops further, it could fill the gap down to $40.50, which it reached last October. 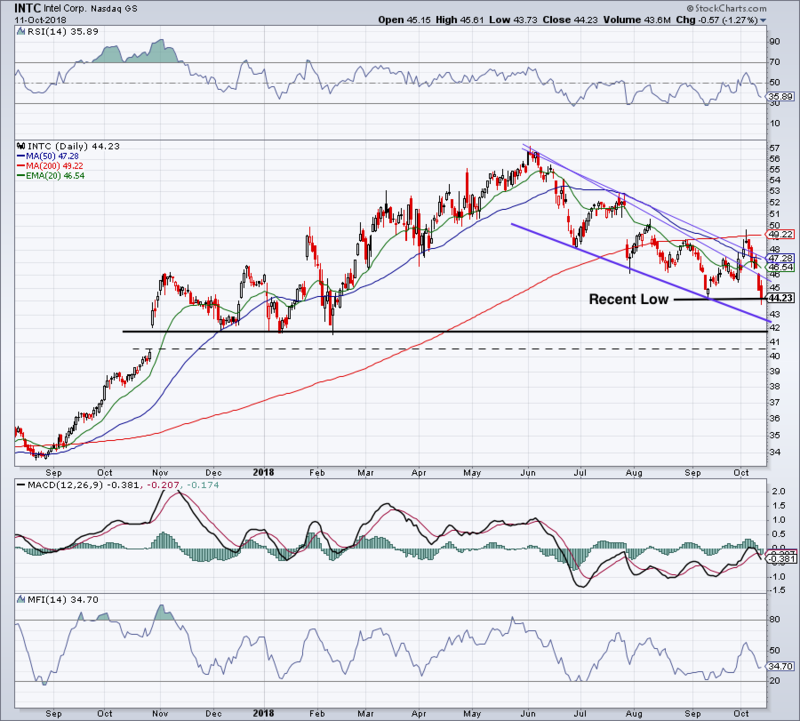 Down in this area, INTC stock seems too attractive to ignore. At $40.50, INTC would trade at or below ten times its earnings and yield almost 3%. The company is not perfect, and its growth is lackluster compared to that of NVDA and AMD. But at some point, the valuation of the shares has to account for that and in the low $40s, I think it does. From a technical perspective, INTC stock will have a much better risk/reward in this area, compared with Intel stock price today. On the flip side, if INTC breaks out over its moving-average resistance, Intel could regain its 200-day moving average. At that point, we would need to re-evaluate the name. The post When Should You Buy Intel Stock? appeared first on InvestorPlace.